This recipe is what seasonal eating is all about. With fresh ingredients, simple cooking techniques, and not a lot of fuss the flavors shine. The turnips at the farm are cranking right now and I absolutely love using the whole plant–root to leaf–you get more bang for your buck when you use every part of the vegetable! We tell our CSA members and farmers market customers who haven’t tried salad turnips yet to eat them raw before cooking them. They are so darn good raw that sometimes I think cooking them can take away their natural sweetness. So if you’re in the camp of folks who haven’t tried the little Japanese salad turnips yet, please give them a whirl the next time you cruise around the farmers market. They’re a true seasonal gem! And speaking of a seasonal gem, the turnip greens pesto was divine. Especially when tossed with grilled chicken, crumbled feta and turnip noodles. This meal was a simple, yet creative way to enjoy the spring bounty. We served our noodle bowls with some big chunks of sourdough bread and a drizzle of olive oil from Oregon Olive Mill from Red Ridge Farm. The olive oil is delightful and I’m so happy to discover a local source for oil. This meal tastes best when enjoyed with a glass of crisp summer wine and a good dinner date. Cheers to the spring harvest! In a large ziplock bag combine the chicken breasts, lemon juice, oil, garlic, salt and pepper. Set aside to marinate for 30 minutes. While the chicken is marinating combine all the ingredients for the pesto in a food processor. Process until smooth and creamy. Taste for seasonings and adjust as needed. Preheat an outdoor grill to medium-high. Remove the chicken from the marinade and place on the grill . Grill the chicken for about 6 minutes per side or until no longer pink in the middle. When cool enough to handle chop the chicken into small chunks. 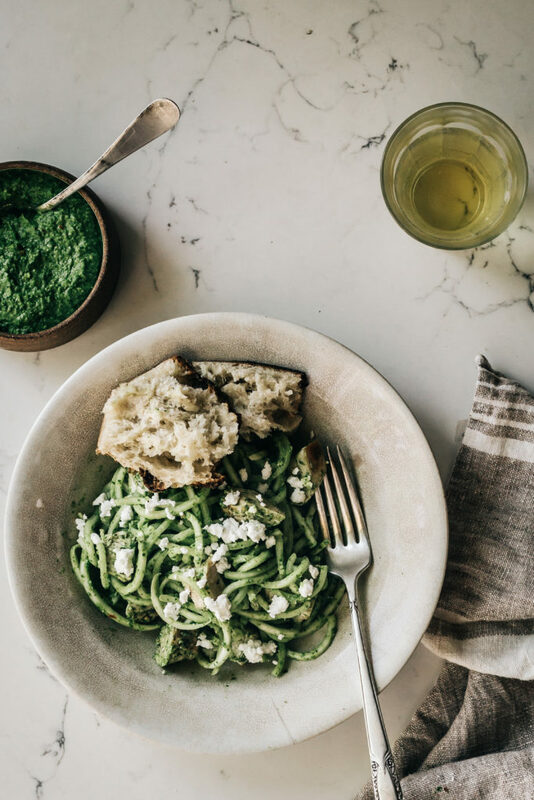 Toss the raw turnip noodles (no need to cook them) with the pesto, chicken, and plenty for feta cheese. Serve with big chunks of sourdough bread and drizzle everything with a little olive oil. Thanks for the newsletter and recipes. How large are the turnips? Thanks.